Today Catholics celebrated the Feast of the Epiphany. 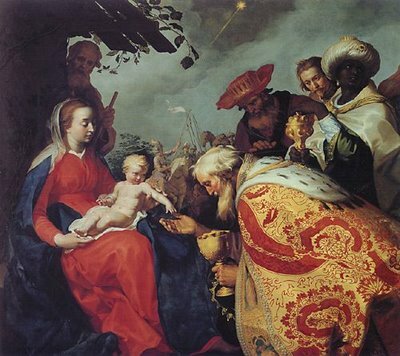 This is the day the Wise Men from other nations came to worship and adore the Christ Child. Now we know this happened much later than it is celebrated, but this is the day the Church chose to celebrate and end the Christmas season. Father Jack’s homily about the importance of Epiphany really spoke to me. The Feast of the Epiphany is the celebration of Christ coming for ALL men, the Jews and the Gentiles alike. Having these wise men from other faiths and cultures coming to Christ symbolizes us coming to Christ and God’s love for everyone. As Christ told us, the greatest commandment is “To love one another as I have loved you”, so we are called to love everyone as these wise men loved Christ and as He loves us. He told us that we called to love the spouse that annoys us, the children that irritate us, the drive that cut us off, and even the Steelers fans (we live in Baltimore Raven country). We may not have to like them at that time, but we are always called to love them. Have a wonderful Epiphany and remember to enjoy and love your family! As Catholics we believe that we are to perform works of mercy to help others and ourselves along our faith journey. Last week I discussed the Corporal Works of Mercy in the home. Today I want to discuss how mothers and fathers fulfill the Spiritual Works of Mercy in the home. I know first hand how hard it is to perform anything other than a basic prayer with a young child in the home. If you have more than one child, it becomes so much harder. Then if you add in something like a special needs child or homeschooling, the journey becomes even more of a struggle. As Catholics we believe mercy is a virtue of our personal will that allows us to have compassion for, and hopefully alleviate another person’s misfortune. The corporal works of mercy help with a person’s physical or corporal needs. The spiritual works of mercy help with a person’s soul. •Pray for the living and the dead. How are we, as parents, to perform these spiritual works of mercy in our homes? Here are my thoughts. Instruct the Ignorant –Our primary job as parents are to take the little blobs of humanity that God has entrusted to us and form them into God loving Christians. This means we teach them how to be compassionate towards themselves, their family and others. We teach them how to feed themselves, dress themselves, numbers, and letters. We teach them how to pray for others, the world, and that it is okay to pray for their needs too. Counsel the Doubtful — We teach our children how to respond to questions that make them doubt themselves and their families. We teach them how to respond to those that question their faith. We teach them where to go to look for answers about their faith when others make them question that faith. Admonish Sinners — This is an easy one. We are all sinners. Including that precious little child in the middle of a temper tantrum because you, as the parent, said no you cannot go play in three feet of snow in a swimsuit. We correct them for hitting others, we correct them when we catch them telling a lie. We help them to understand that as humans, we are sinners and we need the grace in the sacraments to help us get through this life and get to heaven. As Catholics, we teach them about the Sacrament of Reconciliation. This sacrament that allows us to actually hear God’s love and forgiveness expressed to us from one of his representatives here on Earth. Forgive Offenses Willingly — Again as a parent this will be practiced often. Take the examples above. The one that screams “I hate you” will come up in a calmer moment and say “I am sorry, I didn’t mean it.” You say that is okay, I know it and forgive you. Then the offender gets a hug. The toddler gets to say he was sorry and you say I forgive you and gets a hug too. Even that teen will say I am sorry, and you say I forgive you, put the punish stands. Comfort the Afflicted — Afflicted means to comfort someone who has physical or mental pain. As a parent we will often comfort our children. There will many illness of the body while a child is growing up. There will even be mental pain too. Especially in those hard middle school years: they are best friends one day and enemies the next. Or there is the first break up with a boyfriend or girlfriend. Pray for the Living and the Dead — As Catholics we believe in the communion of the saints. That means all people, living and dead, are connected as one in the Body of Christ. We can pray here on Earth for those that are in heaven and we can ask for them to intercede for us with our Lord. We also believe in Purgatory, so we pray for those souls in Purgatory so that their time spent away from the face of God will be shorter. We teach our children about these beliefs so that they can pray for all the saints of the church. We must first take the time in our home to instruct our children in these things. Then we can expand to the rest of the world. If you would like to snag the Advent Wreath Graphic that you see in the sidebar you can grab it from The Curt Jester Blog. Take some time a look around his site, you will laugh and learn a lot. There was a discussion started on board that I often visit. The talk was about corporal works of mercy and how hard it is to perform them with all the demands on a mother’s and father’s time. Feed the Hungry — fixing those three square meals day in and day out. Let’s not forget the time that goes into meal planning, shopping and keeping it all organized. Give Drink to the Thirsty — giving out that cup of milk, juice, or water for the 20th time in a day. And those with newborns that means getting up every 2 to 3 hours round the clock for quite a few months. Clothe the naked — chasing down the slippery, wet toddler running down the hall after a bath and wrestling them into pajamas. Not to mention making sure all the laundry is done so the clothing they have is clean. Plus we cannot forget the numerous diapers that are changed. And if you had multiples, you know that number multiples exponentially! Harbor the harborless — providing a safe place to land after a hard day out in the world for both your spouse and your children. We provide a place where they can let their hair down and be themselves, warts and all. Visit the sick — how many of us have not had to get up at 2 AM and care for a sick child? And then have to do it again and again in the same week because that nasty stomach has a 24 hour incubation period. Oh and you better be keeping up with the laundry to make sure you clothe the naked during this time! Ransom the captive — picking up that baby or toddler from their crib and letting them start to explore the wide world or take care one of the other corporal works of mercy like change that diaper or feed them. Bury the dead — this one can get tricky. I know I often tell my children that I brought them into this world and I can take them out (a la Bill Cosby), but murder is forbidden by the Ten Commandments. If I had to take them out, then I would bury them before I went to prison. If you think about it, you help to bury those childhood fears as your children grow up. In my case, I actually had to bury a little one and I know many others have had to do the same, so that is a literal performance for this corporal work of mercy. I pray many do not have to actually do this. I often say if you cannot practice these things at home, you cannot perform them outside of the home with a true heart. As a parent you are practicing these corporal works of mercy, and most important of all teaching you are teaching your children to do the same. You will expand from your home to the world as your children grow and you have more “time” outside of the house. This was taken from over at A Mothers’s Rule of Life: Thoughts for Moms. Holly Pierlot wrote a book to help Catholic wives and mother’s develop a a schdeduled life similar to the Maxwell’s of Managers of Their Homes. I was reading through her site and came across this. And boy is sure true in this day and time. 16. We’d be relating everything on earth to our eternity of bliss with God. 21. We’d find fulfillment, meaning, peace, joy, love and all the other fruits of the Holy Spirit. Kinda makes it seem like our daily prayer is important and necessary to a good life and being a good Christian!